No Monarch in the season opener. Feels weird. I have a feeling the CGC-grader-as-timestamp was someone’s 4am miracle. Possibly the longest post-credits sequence in the show’s history? I’m expecting for a fan remix that puts the story in chronological order. I guess you’d need a torrent for that, though, and the show is MIA on the main trackers. 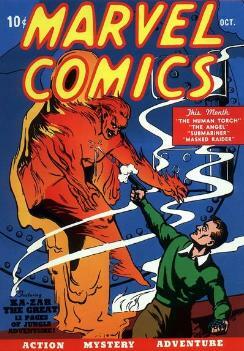 Here’s the real cover to Marvel Comics #1, faithfully reproduced in the episode. ComicsPriceGuide.com says this issue is worth $360,000 for a CGC-graded 9.6 copy. Overall, though, bravo. This is Jackson and Doc’s growth spurt as storytellers, and we’re all being made witness to it. I can’t wait for more.